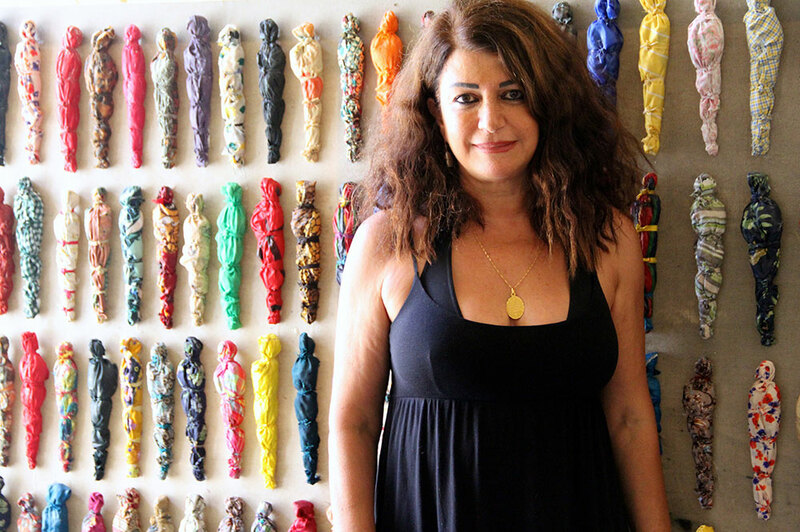 “I have always been involved in the art scene in Damascus. After the situation in Syria deteriorated, around October 2011, thousands of Syrians fled to Lebanon, among them many young emerging artists. With the difficult conditions and emotional trauma, artists had to take available jobs in construction and in restaurants instead of creating art. Given the situation and my belief in the importance of art in times of war, the idea of the Art Residence in Aley (ARA) arose. I came to London in the summer of 2015, moving from Beirut with my two children. I was very vulnerable, alone, with no support structure and nothing to back me up. It was difficult, I was often miserable and lonely, I was shocked by the coldness, by all the rules in London, a grey shell impossible to crack open. I was this determined person who will not give up, I carried with me my long time and extensive experience in art and the cultural management field and my vast network of Syrian artists, my eyes were wide open. I studied and hold a Masters degree in Museums, Galleries and Contemporary culture at Westminster University. After graduation I gained endorsement from Westminster University for establishing Litehouse Gallery. It was both a wonderful and a challenging period”. Talk at ”Arab Migrations in 20 Century” conference at Duke University, January 2016, Durham, North Carolina.